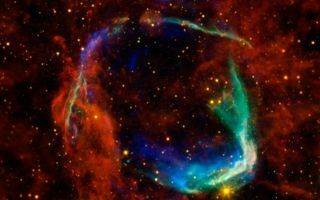 This image combines data from four different space telescopes to create a multi-wavelength view of all that remains of the oldest documented example of a supernova, called RCW 86. This space wallpaper combines data from four different space telescopes to create a multi-wavelength view of all that remains of the oldest documented example of a supernova, called RCW 86. The Chinese witnessed the event in 185 A.D., documenting a mysterious "guest star" that remained in the sky for eight months. X-ray images from the European Space Agency's XMM-Newton Observatory and NASA's Chandra X-ray Observatory are combined to form the blue and green colors in the image. The X-rays show the interstellar gas that has been heated to millions of degrees by the passage of the shock wave from the supernova.